Welcome to our complete guide on finding the best personal blender for your needs. Newly updated for 2019. Personal blenders which are also commonly called “Single-Serve Blenders” have become the fastest growing segment of the blender appliance category due to the popularity of healthy smoothies. 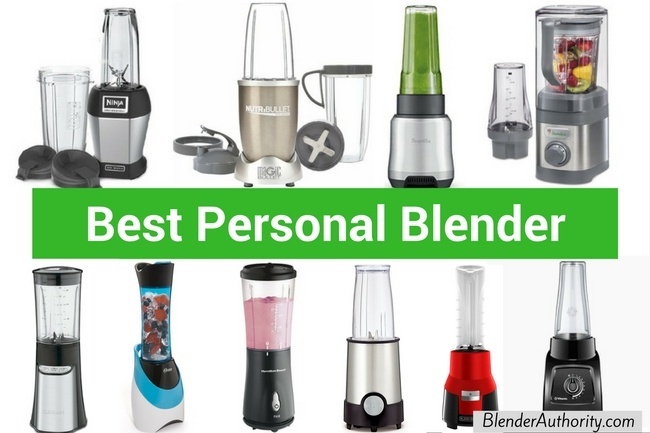 This is a comprehensive overview and ranking of the top personal blenders on the market based on our experience, testing, reliability, performance, and customer feedback. We will continually update this guide as the market changes. -> In a hurry ? read about our #1 choice. In recent years there have has been a growing number of choices for single serve blenders. Some of the most popular models are from smaller brands who only target the small blender market. Many of the larger kitchen appliance manufacturers have also added compact on-the-go blender models to their product lineup. In this guide we only focus on the single-serve models. We do not include any of the full-size countertop blenders that also come with individual size containers. The main differentiation when comparing blender models is power, accessories, and features. They can range in price anywhere from $25 to more than $200. Single serve blenders are perfect for making small portion recipes, healthy smoothies to go, and fast morning protein shakes. They also work well for activities like chopping nuts and pureeing sauces in small quantities. Small blenders offer a wide range of capabilities for their size but they aren’t as powerful as many full-size blenders and are limited in the amount of ingredients that they can blend. The common reasons that people choose a compact blender over a full-size countertop blender is the compact size, price, and ability to quickly make small batches. As we mentioned earlier, there is a wide price range of individual size blenders. Generally price will determine how powerful the blender is and its features. The low price models typically have weaker motors which can only handle simple blending tasks like milkshakes or fresh fruit smoothies but will struggle in pureeing more difficult ingredients like kale, nuts, and seeds. Also, weaker motors can overheat or break sooner if you try to blend more difficult ingredients. As you move up in price you will generally get a more powerful motor(600+ watts) that can handle larger capacities and provide better blending performance. Besides power the other factors to consider are features and accessories. For features, most single-serve blenders have simple controls and single speeds but some models offer variable speeds and preset functions. For accessories, the models will vary in cup sizes, multiple blades, various to-go containers, and recipe guides. TIP – Container width can affect the usability of the blender. Narrow containers such as the Black and Decker Fusion Blade, Oster My Blend, and Hamilton Beach Personal Blender can make it difficult to add ingredients, clean the container, and allow enough room for the blades to finely blend the ingredients. Nutribullet and Ninja single-serve blenders offer more user-friendly wide mouth cups. While not a huge factor, container width is something worth considering. We have written extensively about Nutribullet blenders and used them ourselves for years. The Nutribullet Pro 900 is our favorite model based on its performance and price. (see our Nutribullet Pro Review). It is our top choice for best personal smoothie blender. The Nutribullet Pro has been on the market for years and has top reviews from consumers and many independent blender comparison tests. It will blend ingredients faster than cheap personal blenders and the 900 watts is enough power to puree difficult ingredients like nuts, seeds, and fibrous vegetables such as kale. The 32oz “Colossal” cups can hold enough raw ingredients to blend down to a full meal replacement size smoothie or multiple smaller portions.The cups measure over 4 inches wide which provides plenty of surface contact with the blades for blending efficiency and performance. It is simple to use with no control buttons and hands free blending. For size it measures 15 inches tall and is light enough to be easily stored. There are multiple variations of the Nutribullet 900 which are all the same blender motor base but the difference is in the accessories offered. The most popular package is the 9 piece set which includes 900 watt power base, 2 colossal cups with lids and handles, 1 blade, and recipe book. (The recipe book is very nice to have but you can also find tons of recipes on their website). Overall, the Nutribullet 900 is an excellent blender for the cost and is an excellent choice if you are focused on making healthy smoothies. The Breville Boss To Go is a powerful compact blender that has performed very well in independent blender tests. It was introduced into the market in 2016. It features 1000 watts of power with a sleek modern design and comes with two specially designed tumbler cups (16oz and 23oz) . When it comes to performance, the Breville’s Boss To Go ranks near the top for its ability to make smooth, silky smoothies. 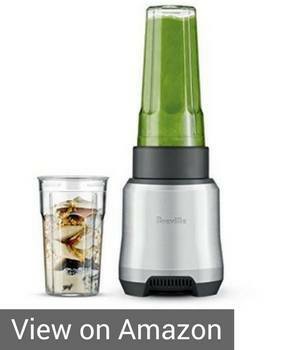 Testers found that the Breville Boss To Go blended some ingredients more finely than the Nutribullet. The reasons we rated it 2nd is: #1) Price is 50% more than Nutribullet 900 and #2) Some user complaints about Breville’s cup locking tabs not lasting. Overall, the Breville has a solid feel and quality design. It ranks near the top for performance among independent small blender tests. For more details read our extensive Breville Boss To Go Review. The Jamba Quiet Shield blender is made by Hamilton Beach and offers a unique combination of being both a single serve blender as well as a top loading conventional blender. It is slightly larger than other single-serve blenders but smaller than a full-size countertop blender. It comes with both a 20oz single-serve and a 32oz top loading container. It has the added bonus of a sound dampening cover for lowering the noise. Features a powerful 1200 watt (1.6 horsepower) motor and is one of the few single-serve blenders that provides variable speeds. It offers a generous 5 year limited warranty which is more than other blenders in this category. For performance, Consumer Reports testing found that the Jamba blender did “very good in overall performance”. Other independent tests found that the Nutribullet 900 and Breville provided a slight edge in performance over the Jamba Quiet Shield for blending consistency and results. The Jamba is well priced and is a good choice if you like the ability to have a top loading pitcher. The noise dampening feature is a nice bonus if you make smoothies in an apartment or early in the morning. 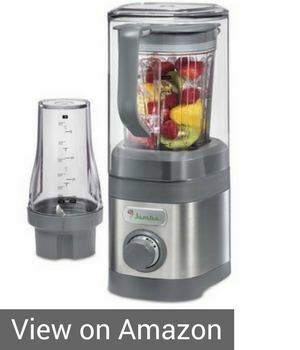 We like the Jamba blender and it is a great option especially for the price. We gave a slight ratings edge to the Nutribullet and Breville due to blending performance, compact size, and ease of use. For more details on the Jamba blender, see our extensive Jamba Quiet Shield Blender review. Ninja makes a wide range of blenders and their Nutri-Ninja models represent their personal size blender product lineup. They have multiple models in their Nutri-Ninja product line which we detailed in our Nutribullet vs Ninja comparison but the main base model is the Ninja BL456 (Formerly the BL450) which is similar to the Nutribullet 900. The Nutri Ninja is VERY popular and has solid ratings from users and independent tests (America’s Test Kitchen choose this blender as their favorite personal blender) . Some tests and users found that the Ninja didn’t perform quite as well as the Nutribullet when blending more difficult ingredients like fibrous Kale, but the Ninja Pro is priced much less than the similarly powered Nutribullet 900. The two issues we have with the Nutri Ninja Pro are 1) You have to hold the jar down while blending so it is not handoffs and 2) The largest cup is 24oz (compared to Nutribullet’s 32oz). While both issues aren’t a major issue but they should be considered. Overall the Ninja BL456 is very well priced and worth considering but we gave a slight edge to the Nutribullet for performance, hands off blending, larger cup, and personal experience using Nutribullet for a long time with no issues. SIDE NOTE – Ninja also makes various full-size blenders that work with their Nutri Ninja single-serve cups if you want the versatility of both a compact and full-size blender. 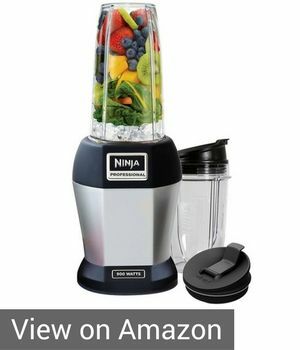 For more details, see our guide to Ninja Blenders. Listed below are some of the other compact blenders on the market worth mentioning that we didn’t pick among our top choices. 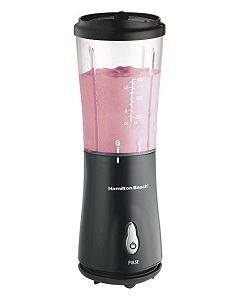 The Hamilton Beach Single Serve Blender (Model 51101BA) is the lowest cost blender and has 175 watts of power. Simple one touch button and 14oz jar. With 175 watts it is limited in its power and capacity at 14 oz so it can only do small portions. It is nice if you need a small blender for travel as it is lightweight and compact. While it is inexpensive, the limited power and capacity make it harder for blending harder ingredients and it can take longer to blend. It is fine if you want a simple small blender for basic fruit smoothies, blending cooked baby food, or mixing protein shakes. Otherwise, if you want to make green smoothies or use a wider range of ingredients in your smoothies then we would go with a more powerful single serve blender. Bella blender brand offers a couple of different compact blenders. Bella Rocket Extract Pro 700 – Bella came out with a higher priced model called the Rocket Extract Pro 700 watt blender to compete with the Nutribullet 600. The Rocket Extract Pro offers the most power for the money among its peers. It has been on the market for 4 years and has decent reviews including good test scores from America’s Test Kitchen. The reasons we didn’t choose this blender as a top pick is because there are user complaints about the blender leaking and issues with quality over time. Generally the overall reviews are positive because it offers nice features for the money but we are concerned with the quality over time. Personally, we prefer the Nutribullet because it has far more positive reviews and independent testing than the Bella but the Nutribullet is twice the price. 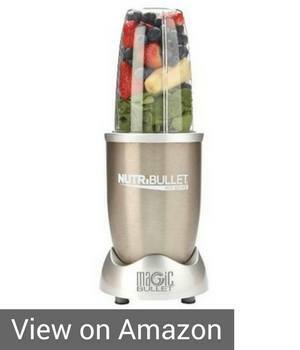 (Another option is the Nutri Ninja which is the same price as Nutribullet 600). 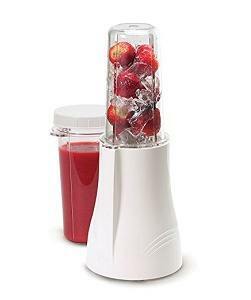 For the low price, the Bella Rocket is worth trying if you just want to get started with simple smoothies or will only use occasionally. It will struggle with pureeing some ingredients in green smoothies. There are more reliability complaints about this blender compared to our top picks but you could buy an inexpensive appliance warranty with the Bella blender for peace of mind. Tribest makes a couple of different individual blender models. The PB-150 is their initial model with 200 watts has 200 watts and a range of accessories. The PB-250 is slightly higher cost as it offers a grinder set. The Tribest PB-350 has the same 200 watt motor base as the PB250 but offers an accessory kit to work with Mason Jars (related article: Mason Jar blenders). All these models are pretty expensive for what you get in comparison to competing personal blenders. The Sweet Home rated the PB-150 well in their tests as a top pick for small blending tasks like simple shakes, dressings, and sauces but is limited in its performance due to its small motor and 16 ounce container size. Tribest also offers one of the only personal blenders with a glass jar called the Tribest PBG-5050-A Glass Personal Blender. This model is too new to the market to have much feedback but the main issue we have with it is the high cost. We didn’t pick the Tribest as a top choice because it is quite limited in its capacity and power and has a high price for its features compared to other small blenders. 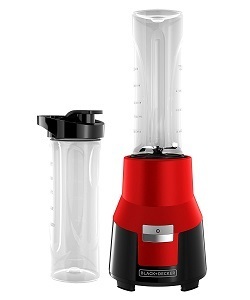 The FusionBlade blender is inexpensive and works relatively well. 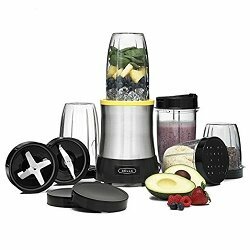 It offers a 20oz blending jar and 275 watts of power which is at the high-end for power compared to other single-serve blenders in this price range. GoodHousekeeping gave this blender 3.5 out of 5 stars as this blender performed well in their various blending tests for making milkshakes, frozen drinks, and grinding coffee beans, but it didn’t do as well making smoothies. A nice benefit of this blender is the 2 year warranty which is longer than the typical 1 year blender warranty offered by many manufacturers. While this blender is very inexpensive, the downsides are its performance with blending green smoothies and the narrow mouth bottles can be less user-friendly. Otherwise, it is a decent small blender for the price especially for simple tasks like blending protein shakes. If you want a more versatile personal blender for making green smoothies then consider our top picks. The Vitamix is considered the top blender brand by most culinary professionals and Vitamix full-size countertop blenders are used in commercial kitchens throughout the world. With that quality and reputation, Vitamix blenders are on the expensive side because they are built to last. Vitamix introduced their S series blenders to compete in the growing small blender market. The lowest priced model is the S30 which comes with both a 20oz and 40oz container. It has a 790watt motor and is well built like all Vitamix products. The two containers are good sizes for versatility. SIDE NOTE – If you already have a Vitamix blender then you can now get a Vitamix Personal Cup adapter to use the S-series personal size cups with your traditional full-size C-series or G-series Vitamix blender. The reasons we didn’t include this as a top pick is because of the high price and the performance wasn’t noticeably better than the Nutribullet or Breville. It has pretty good reviews from Consumer Reports and CNET but there are other user reviews like this one that indicated the S30 was finicky in its consistency. Overall, the Vitamix S30 is well built but reviews seemed mixed on its performance to justify the high price. Honestly, for the high price of the S30 you might as well get a full-size refurbished Vitamix for less which will provide more versatility. You could always add the Vitamix personal cup adapter later on if you really want the functionality of a single-serve. If you are new to Vitamix then see our extensive Vitamix Review guide for our top choices. 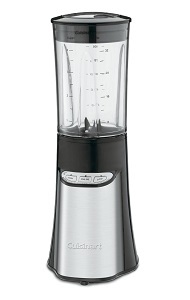 We love Cuisinart food processors and they have had a personal blender on the market for many years. The CPB 300 is a 350 watt compact blender with a 32oz jar, four 16oz travel cups, and 8oz chopping cup. It is very compact and has nice electronic touchpad controls. The reviews are generally good but there are some complaints about it overheating. Also some users said it doesn’t perform well making smoothies although it depends on the ingredients you are using. The Sweet Home compared it to other individual blenders and said it couldn’t blend thick smoothies without the motor getting hot. 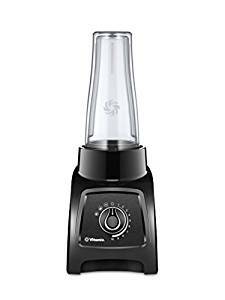 If you watch this video, you can see that the Cuisinart CPB 300 struggles making a smoothie at the 1:20 minute mark and has difficulty pulling the ingredients down to the blade. Overall, the Cuisinart is nice for simple blending tasks like a protein shake, basic fresh fruit smoothie or basic food prep. It is not one of our top choices because the 350 watt motor will struggle blending green smoothies and thick smoothies especially with ingredients like nuts, frozen fruits, and fibrous vegetables. If you are on a budget, the Cuisinart is reasonably priced at just below the Ninja BL456 but it is 3x the price of the Hamilton Beach blender. We would prefer to pay slightly more for the more powerful Ninja or one of our top picks if you will be making a lot of smoothies. There are many personal size blender available but we continue to stay with the Nutribullet Pro as our top choice for performance and price. The lower priced small blenders are usually under-powered for green smoothies and limited in their capabilities, but they can be good for small blending tasks and simple ingredients. The higher priced models are good choices for quality and performance but they start to compete in price with the full size blenders which offer more blending power, features, and quality. The top choices that we listed above offer a nice balance of performance, ease of use, and price. NOTE – If size and portability are the most important criteria for you then take a look at our mini blender guide. Let us know if you have any questions ! Hi Stuart, Yes not being able to add ingredients through the top is an inconvenience with most personal blenders designs. Although once you get used to the smoothie recipes you like and how much to put in then usually you shouldn’t need to open it until its done. The benefit of the upside down design is the cups have a wide mouth which allows for more contact with the blade(good for blending) compared to a narrower base conventional blender design. An alternative is the Jamba blender I reviewed above is still compact and has a top loading jar. Other alternatives are the Ninja Auto IQ compact blender series that have single serve as well as top loader pitcher. Otherwise, maybe you would prefer a fullsize blender with conventional top loading pitcher that also has single serve containers(See Oster 1200 review or the best-selling Ninja BL660 (see Ninja BL660 review). Regarding the “power activator” slots on the motor base I haven’t had a problem with. You mentioned “Magic Nutribullet so I am not sure if you are using the Magic Bullet or Nutribullet blender line. The Nutribullet is better built/stronger than Magic Bullet. On my Nutribullet one time I had smoothie liquid spill on those slots and it made it harder to push the cup into those slots but I just wipe them with hot water cloth and they work fine again. I have heard of people pushing too hard on the cups to get the cup tabs into the slots when it really should be a light push. Some people love the Nutribullet tabs because it allows for hands off blending compared to the Nutri Ninja but I understand if you don’t. I prefer to not have the electronics/button on my personal blender as its less things that can break. You can try squirting some lubricant like WD40 into the little motor base tabs if they ever stick since they move on a springs. Hope that answered your questions. Thanks for reading ! I think you mean purée instead of purify when talking about a blender. Good catch. Corrected it. Thanks Melanie.